Christian Griffen’s Anima Prime seems tailor made for hacking to tell stories in the Exalted setting. I’ve been playing with hacking the system to do so. The results are untested, but go by the unimaginative name of Exalted Prime on the unofficial wiki. If you try them out, let me know how it goes. At 700×700 pixels, the source graphic (which you can reach by clicking on the smaller versions on the caste mark page) have just barely enough resolution to look decent on the decal. Slightly higher resolution might look a bit better. Most of the output I’ve published on this blog was started because I didn’t initially know how to do it. These caste mark graphics started because I wanted to see if I could get the visual effect I wanted entirely within Bryce. I succeeded with most of them, though the sidereal marks required cheating with Photoshop to get the glow to look right. In making this test decal, I realized that I’ve never released the Bryce sources for these caste marks, until now. You can get the zip file with all the original sources here (16.1MB). Feel free to use these sources to make higher resolution versions of these caste marks. Also, you have my permission to use the resulting caste mark images (or any that I’ve posted) to make your own device skins. Just don’t sell them. A “roll and keep” system can be tweaked by simple rules to provide some interesting probability distributions. This post will explain what a “roll and keep” system is, take a look at how one such system can be manipulated and provide some source code to experiment. Since the late 1980’s, certain roleplaying games have made use of “dice pool success” mechanics. Such systems roll a handful of similar dice (usually d6 or d10), with the number of dice usually determined by the traits of the character for whom the roll is being made. That is, typically someone with more skill in something will roll more dice, also referred to as having a “larger pool”. Usually, each die rolled is compared individually to some sort of target, and if the die meets or exceeds that number, the die is considered a “success”. 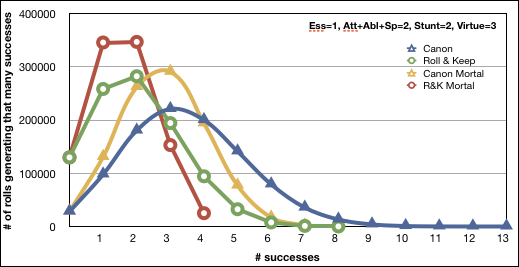 The quality of the roll is determined by how many successes are generated (i.e. how many dice meet or exceed the target). One appeal of this type of mechanic is that it allows many variables to affect the roll, using a number of different mechanisms. A system might allow the situation to alter to number of dice, the target number, the number of successes needed to reach a goal and so on. As a result, many variations on this the basic idea can be found in different games. One type of variation is known as a “roll and keep” system. The idea here is that you roll your pool, but only get to keep some subset of the dice. For example, you might roll seven dice but only be able to keep three, selected after the roll is made. Obviously, players will typically pick the best three results. While not many games use roll and keep systems, the appeal of them is twofold. First, it adds yet another variable into how the roll can be manipulated (i.e. changes to how many dice you keep). 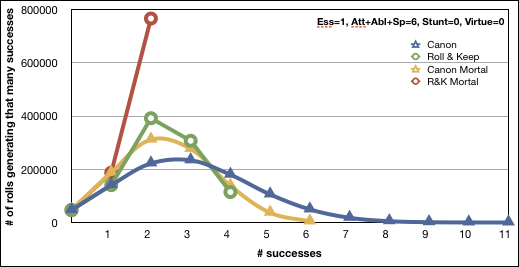 Second, and more importantly, it allows a game designer to exert some control over the maximum number of successes generated by a roll. That is, some pool-based systems can get intro trouble with “runaway successes”, where various imbalances between characters can get magnified, with some characters scoring ungodly numbers of successes. Using a roll and keep system allows a designer to focus on a “sweet spot” for the number of generate successes. This post aims to investigate what various rules variations do to a roll and keep system. One caveat: this analysis starts with a very “crunchy” (rules-heavy) system, and mutates it into an even more crunchy system in some ways. The point is really to see what happens within the roll and keep system, rather than try to convince you that the result is somehow “good”. The system does what it does; it’s up to you to decide if that is useful to you. 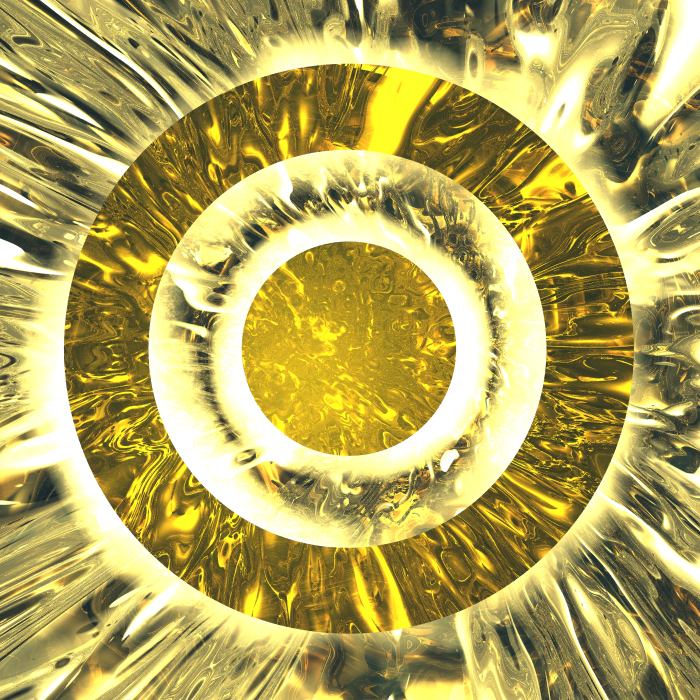 It uses pools of d10s. It uses a large number of “traits” rated (mostly) one through five. Some of these are called “Attributes”, some “Abilities”, but there are other kinds as well. Pool size for any given test is based on one Attribute, one Ability and, optionally, one “specialty” (rated zero through three). Dice that roll a seven or higher generate a “success”. Dice that roll a ten count as two successes. One important trait is called Essence and is a very rough measure of “power level” in the game. Mortals have an Essence of one. Very powerful gods have an Essence of ten. Player characters in the game are superhuman, typically with an Essence of two to five. Players have access to magic that allows them to (among other things) manipulate dice in various ways. For example, they might spend “points” of this magic (called motes) to buy extra dice for a roll, etc. Player characters can be different kinds of superhuman, each kind having their own “style” of magic. These different kinds are explicitly not equal in the game, with some being “more powerful” than others. Everything in the game that can use dice pools can gain a few additional dice for a roll just by giving a cool description of what they are doing. This is called “stunting”, and can provide from one to three dice. Everything in the game that can use dice pools also has a set a traits called Virtues. If they are really desperate, anyone can “channel” a Virtue to gain dice for a roll. This is costly, and can only be done a limited number of times. As with the standard system, characters roll Attribute + Ability + Specialty. Characters keep a number of dice equal to their Essence + 1. Note that this limit is intentionally on the low side, compared to the size of the pool. This has several ramifications but generally means that adjustments to the keep limit are more formidable than adjustments to pool size. Stunting works as in the standard system, adding dice to the roll. 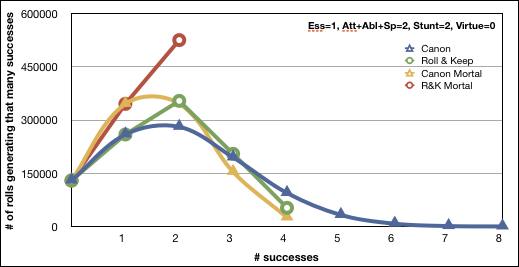 Solars (and their offshoots) can spend 2m to buy one success, with a maximum of Ability successes added to a given roll. Lunars, prior to rolling, can spend 1m to convert a pool die into a single success instead of rolling it, with a maximum of Attribute die so altered for a given roll. Sidereals can pay a flat 3m to add one to the number of dice they roll, but count two successes for rolling 8 or 9 as well as 10. Alchemicals can pay a flat 1m to raise the number of dice they keep by two. This can only be done once per test. Terrestrials can pay 1m to add two dice to their pool. They may add up to Ability + Specialty dice to a given test. For a particular test, a character uses an Attribute rated at 2, an Ability rated at 4 and a specialty rated at 1. This provides a dice pool of seven dice. The character has an essence of 3, which means, after the roll, she will keep four of those dice. Her roll is an extremely good one: 2, 5, 8, 9, 9, 10, 10. She obviously elects to keep the best four dice, which are 9, 9, 10, 10. Each 9 gives one success. The 10s give two successes each. Her total is six success. Later she needs to make a very similar test (based on the same traits). This time, though, she describes her action in a really neat way, and is awarded two stunt die. While this makes the pool larger, it doesn’t change how many dice she can keep. This roll happens to turn out worse: 1, 2, 4, 5, 5, 5, 6, 8, 10. She still keeps four (5, 6, 8, 10), gaining three successes (one for the 8, two for the 10). Even later, she has to make the same kind of test again. This time she is in real trouble. She describes well again, gaining two stunt dice. She also channels one of her virtues (rated 3), which allows her to keep three additional dice. She rolls well again: 3, 5, 6, 7, 7, 7, 8, 9, 10. Thanks to the channel, she keeps seven dice (6, 7, 7, 7, 8, 9, 10) giving seven successes. The various choices were analyzed using software simulation, written in Python (source). The simulation makes a million rolls using 30 dice each. For each roll, the stream of dice is used by a bunch of different “strategies”. Each strategy represents a type of character, adjusting its traits and, importantly, kind. The strategies are set up such that they cover all relevant combinations. Each of these is fed the 30 dice results, but how many they actually use depends on the strategy. If a strategy is supposed to have a pool size of 12 dice, it only takes the first 12 dice for its pool and ignores the rest. By working in this way, all of the strategies use roughly the “same” results for their million rolls. This is not exact, of course, as some strategies use more dice than others, but it provides a more “fair” comparison of the strategies (and is much faster than rolling pools independently for each strategy a million times each). 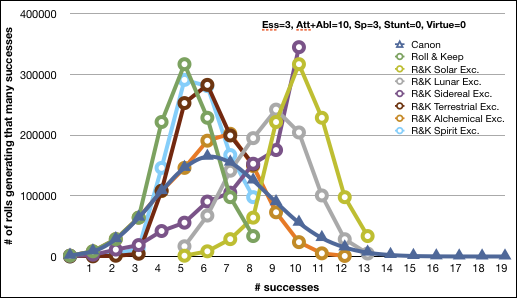 One oddity you see emerge here is that the because of the way sidereal magic works, they are more likely to get even numbers of successes than odd. Also note the “canon” line in the graphs above. Bear in mind this is just a standard roll in the original system, without any magical augmentation. Since each die can possibly generate two successes (by rolling a 10), Exalted has a bigger issue with “runaway successes” than most other pool based games do. The “roll and keep” tends to keep runaway successes under the original system more constrained, with magic use having a bigger impact than luck. Solars are simply “more excellent” than the others, but since they are limited in how many successes they can buy, not overwhelmingly so. This is a departure from the canon rules, were the gap between solars and others can be severe. 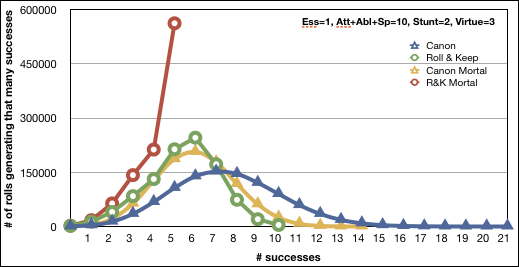 Lunars have the same minimum and maximum successes as solars, but average one fewer success. Still they outshine other types. 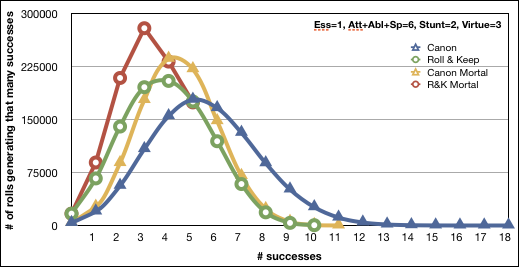 Sidereals leave much more up to luck, but still regularly hit celestial levels of success. 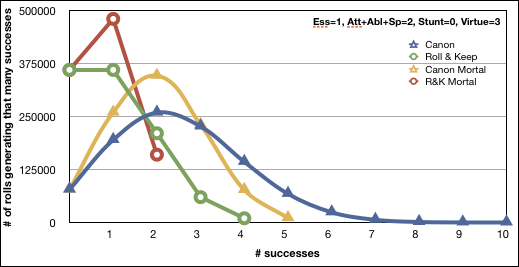 Their minimum is much lower than solar and lunars (they can still actually get zero successes), and their max is slightly lower, but they have a much flatter curve, that favors the high end. Terrestrials, unlike celestials, can’t gain more with magic than without, but are much more likely to hit the high end of their range. 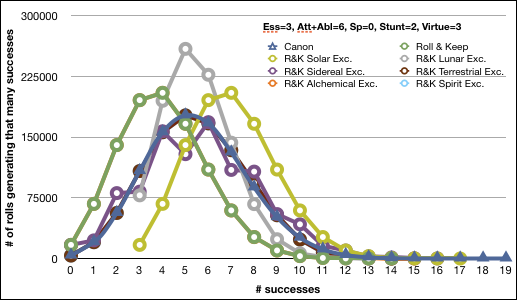 Alchemicals most closely match the canonical curve. They can do better than even solars, but not very often. Spirits are similar to, but outmatched by, terrestrials. 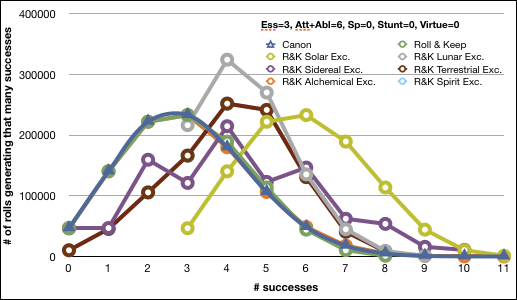 One thing that turns out to matter a lot in this analysis (and the reason Exalted is being used as a base) is the notion that rolling a 10 generates two successes. This mixes in interesting ways with the keep limit. Obviously, 10s are much more worth keeping but, more importantly, they allow the success count to exceed the keep limit. That is, even if you can only keep two dice, it’s possible to get four successes. Further, the more dice you roll, the more likely that outcome is. For example, if you roll only two dice and keep both, the chance of getting four successes is only 1% (with a 34% chance of failure). 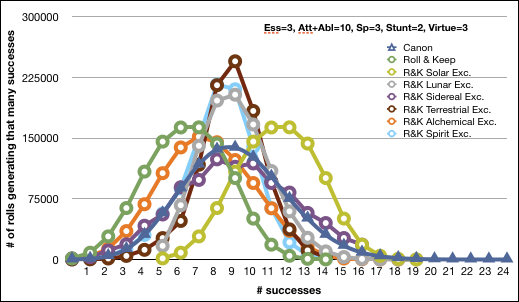 If, however, you roll 12 dice and keep two, the chances of four successes is closer to 35% (with the chance of failure dropping to around 0.2%). So, the limit and the 10s rule combine to reign in the number of total possible successes, but yet still let skill matter. 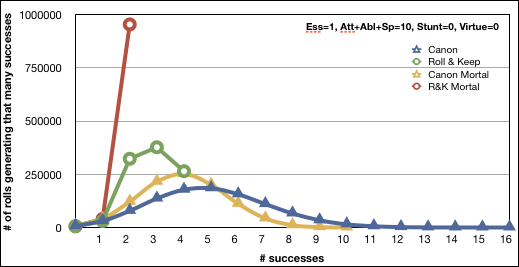 This is easier to see when looking at the results for the low end of the power scale: Essence 1 characters. Since mortals can’t use magic (and everyone that can use magic has Essence 2 or more), graphs at this level are more simple. At this level, it is a bit more useful to look at how the roll and keep results change the dynamics of the game compared to the canonical system. 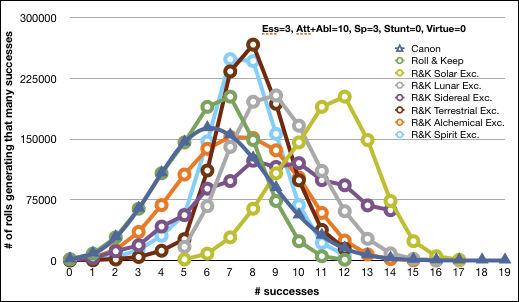 Heroic mortals cannot do better than four successes here, even with the stunt, because stunting doesn’t change the cap. The standard mortal can only get two successes in this situation. Compared to not stunting, the difference for the standard mortal is a drastic increases the likelihood of getting two successes (from around 16% to 53%), and decrease the chance of failure (from 36% to 13%). 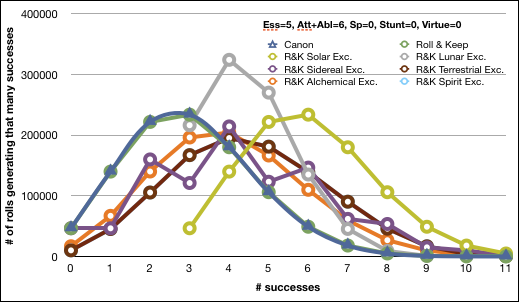 You can also see how, compared to canon, the 2+ success results are “compressed” into a lower range. Under r&k, the mortals still can’t crack four and two successes, respectively. In this case, the culprit is the size of their dice pool. Their keep limit is over twice the size of how many dice they actually can roll. The canon case has much different behavior here, as it is rolling five dice instead of just two. You can really see the divergence from canon here. Compare standard mortals in canon to heroes in r&k, for example. 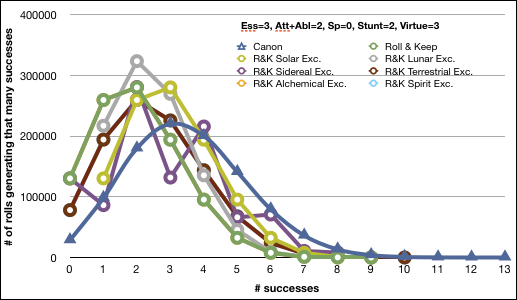 In this case, canon mortals gain 7 successes 3 times out of every two thousand rolls. Heroes in r&k don’t do this as often, though they can get 8 successes while standard canon mortals can’t (meanwhile, canonical heroes can get as many as 14). 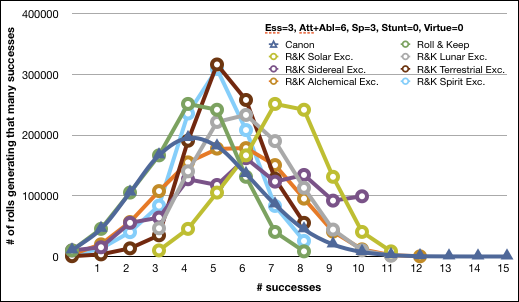 Note that standard r&k mortals still cannot achieve “legendary” successes, though they could with a higher virtue. So, on the low end, this system seems to at least function, and does a fairly good job of “keeping the man down”. Can’t have mortals get too uppity. With enough stunting and heart, they can still do “legendary” things. While initially intended to be a somewhat generic look at how you might manipulate a roll and keep system, the results actually turn out to depend heavily on the specifics of the original system used, particularly the rule that awards two successes on a 10. On the other hand, if you consider the specific flavor of the game in question, you actually can use roll and keep to make the game work a bit more like it is described. That is, with some minor mechanical changes, the success rate of the various kinds of exalted can be tinkered with until they match the relative power levels implied by the game’s descriptions, all in a way that minimizes the huge success disparity of the original system. Version 1.1 of When Autochthon Dreams , a collection of fan-made artifacts for White Wolf’s role-playing game Exalted®, is now available for download. Updated the “Materials” chapter with information about infernal materials. Correction of many typos and phrasing problems. Intra-document hyperlinks on page numbers in the index are a bit more snappy. Formatted to allow reading from Acrobat 5.x and up (previously required version 7.x or better). This should fix some incompatibilities reported with in-line viewing with some browser plugins. DivNull Productions is pleased to announce the release of When Autochthon Dreams , a collection of fan-made artifacts for White Wolf‘s role-playing game Exalted®. Writing for this work originated in a number of fan sites for Exalted, particularly the Exalted wiki and Exalted Compendium Redux. Thanks go out to the writers who allowed their work to be included. The artwork used in the PDF results from a bit of an experiment. Rather than an using an open, take-what-you-can-get approach, DivNull looked for fans of Exalted on deviantArt, inviting 75 of the most talented to participate. This process intentionally avoided inviting artists that have a lot of work published in Exalted books. Artists were invited over a long period, and given months of lead time to prepare art for today’s release. Of those contacted, six actually delivered art, a response of about 8%. This response was less that what was hoped, but realistically better than expected, especially since no payment was offered or given. Thanks go out to those artists who contributed. Thanks also go out to White Wolf for their Dark Pack guidelines, which allow supplements like this to be created in the first place. Uncouth, DivNull’s variant of Exalted, is done enough for playtesting. It has been an interesting experiment, but it probably won’t continue much further, barring inspiration, or a lot of feedback. The variant aims to replace the cause-based mess of thousands of special case charm rules with a simplified, effect-based approach making use of a few dozen mechanical tricks. The basic change to the game carries with it a number of secondary effects, including a simplification of resolution, combat, timing and some other things. Very few of the rules have been playtested, and some (particularly the social stuff), are based on more spurious math than others. It will no doubt need to be tweaked for balance. If you are an Exalted fan, feel free to give it a run and leave comments here or on the wiki. Around ten months ago, a project on the Exalted wiki started, aimed towards getting “orphaned” pages connected in to the main navigation pages. This was made much harder than it needed to be by virtue of this particular wiki using some very old software. Even worse, it’s not even using the latest version. Though this software was originally used for Wikipedia, it has been vastly outpaced by its replacement, MediaWiki, which has many features lacking in this old software. In particular, MediaWiki gives you a list of which pages are not linked to by anything else. This old software cannot. So, DivNull produced software to find these “orphaned” pages, which (hopefully) accelerated the process, which finished today. The only reason to even mention something this trivial is that this code actually used from real computer science, in particular work done with directed graphs. Having already scraped the wiki source text for the whole site (for other reasons), it was fairly simple to build a directed graph of page links, representing which pages linked to others. Once you have this graph, though, how do you answer questions like “what is the shortest path between this page and that one”? One good thing here is that the wiki has a single main entry page, and the idea was to find a path from that page to every other page in a short number of steps (no more than five steps turned out to be the most useful, given the way the wiki is organized). This simplifies the problem from finding the shortest path between two arbitrary nodes to finding the shortest path between one arbitrary node and one specific one. This still sounds computationally expensive (and it is), but also smells like a problem that someone has probably already found a good answer to. A solution came in the form of some algorithms in the Perl Graph module, which is chock full of graph-based utility (and can even export to dot files). In particular, it contains an implementation of Dijkstra’s single-source shortest path problem algorithm, which solves this exact problem. Using these routines, generating the orphan list was fairly simple. Producing diagrams of the wiki graph, however, was not. Though the graph is easily represented in the aforementioned .dot format, there are so many nodes that existing rendering routines choke on them. And, even if they did complete, the result was horrible to gaze upon. DivNull searched for some other approaches and found some interesting approaches to rendering large, sparse graphs. One idea was to draw represent the page links as a sparse matrix. The University of Florida seems to do a lot of research in this area. Drawing them, however, seems fairly straight forward, so will probably be done as some future point. Another idea uses a force-based approach specifically for very large graphs. A paper details a system that could easily handle a data set this size, but experimenting with it for the wiki will have to wait. Naturally, new orphans will surface in no time, but its good for now. Intended for use in Exalted forums, the last of the artwork representing celestial caste marks from that game have been completed, as the new sidereal marks join the rest. Like the others, these are renders within Bryce. Unlike the others, they required some post render work in Photoshop in order to get their glows to look right. In the game of Exalted, there was a long past First Age, when everything was awesome (except for the growing psychosis of the demigod rulers of the place) and Creation was much larger. No maps had been produced of this time, but DivNull has released one to Lore 5, created as if it were a tile mosiac that might be found in a tomb or ruined palace. This was a raster project done in Photoshop, with much of the heavy lifting done by a demo of Xenofex. This could be improved in a number of ways, particularly by adding a bit more depth.